Hamilton Fringe Festival 2018 – Seen. 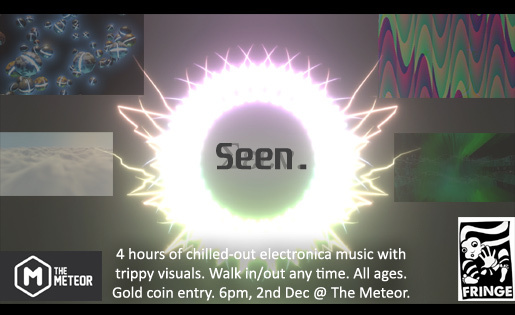 A chilled-out night out filled with electronic/ambient music and beautiful 2D/3D generated visuals. 9 screens are in the middle of the room, each displaying different realtime-generated moving visuals which oscillate and move to to the music while it plays. Sit up, lie down or just relax into a beanbag. Leave and return any time you choose, on till late.